Over the course of a month the team, consisting of engineers from companies all across Europe was coordinated by representatives from the UK Space Agency as well as the German, French, Spanish, Italian and European Space Agencies (ESA). They tested a variety of new technologies, including data fusion systems, a plug-and-play sensor suite and an open-source operating system for robotic control. As far as we know, Mars is the only planet populated entirely by robots! Due to the time taken for commands to travel to Mars (eight minutes each way), hand guided robots are limited to travelling only a few dozen metres a day. New software developed in the UK will change this, enabling future Mars rovers to make their own decisions about where to go and how to get there, driving up to a kilometre per day so delivering more scientific returns per mission. The UK is a world leader in robotics and the government is working with business and academia to encourage further investments in the technology as part of the modern Industrial Strategy. Catherine Mealing-Jones, Director of Growth at the UK Space Agency, said: "Mars is a very difficult planet to land safely on, so it's essential to maximise the discoveries from each successful touchdown. New autonomous robot technology like this will help to further unlock Mars' mysteries and I'm delighted that the UK is a key player in this cutting-edge field." Companies and universities from around the UK including Airbus Defence and Space, Thales Alenia Space, Scisys, King's College London, the University of Strathclyde, and GMV-UK participated in the software testing at Ibn Battuta Test Centre in Morocco in December. Airbus in Stevenage is the prime contractor for the new European Space Agency (ESA) ExoMars rover, due to land on Mars in 2020. Following a public competition last year, the UK Space Agency will announce the name of the new UK-built rover this spring. The UK Space Agency is the second largest European contributor to ExoMars, having invested euro 287 million in the mission and Pounds 14 million on the instruments. This, in addition to successful negotiations with ESA, secured key mission contracts for the UK space sector. The ERGO Autonomy Framework: The autonomy framework enables the rover to make decisions by itself without the need for human intervention. These decisions could be about the path a rover needs to take to get to its destination. It also means the rover can make decisions about managing its resources, for example shutting down certain functions to conserve power. It will also give the rover the ability to investigate things it deems to be interesting, things which human operators might miss. The INFUSE Data Fusion: Data fusion is the fusing together of data from different sensors and sources in order to create useful information such as maps, which the rover can then use to navigate successfully across the difficult Martian landscape. The data will be provided by different types of camera, sensors, trackers and torches to give the rover a full understanding of the Martian world around it. The I3DS Plug and Play Sensor Suite: The rover needs various sensors to enable it to see, perceive and understand the Martian world. Using a 'plug-and-play' approach means that sensors can be installed and removed easily according to the mission requirements. The Sensor suite also has a unique, built-in computer called an ICU (Interaction Control Unit) that processes the signals from the sensors into information before passing that information to the Data Fusion system. The ESROCOS Operating System: Robots need operating systems to function, just like your computer, tablet, phone or laptop at home. The operating system provides the low-level software and libraries required by the robot to undertake basic functions. It also provides the language and framework with which the other software (such as the ERGO Autonomy Framework and the INFUSE Data Fusion) must adhere in order to create a coherent and integrated system. In other words, this is the core software that provides the rules which bind all the other systems and software together. 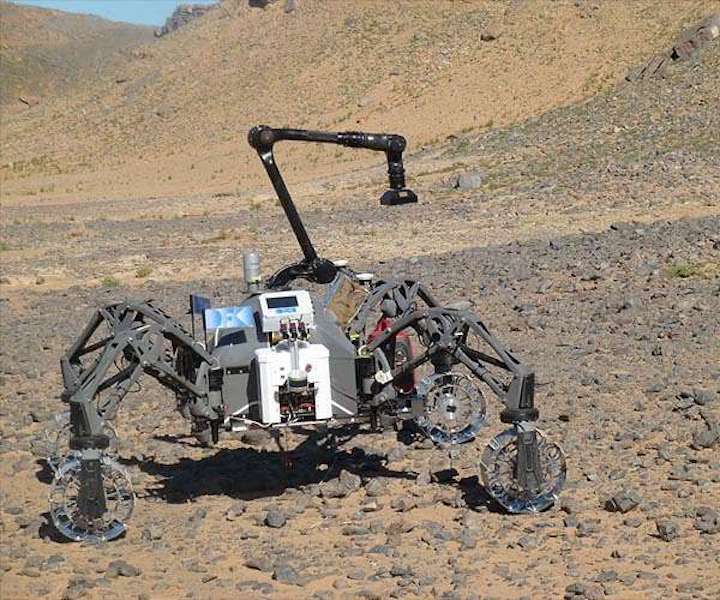 The new software systems were mounted onto a four-wheeled rover called 'Sherpa,' provided by the German Robotics Innovation Centre DFKI. The Ibn Battuta test centre is named after the 14th century Islamic explorer of the same name, and is a popular site for testing Mars rovers, as the red, rocky terrain is very similar to the surface of the Red Planet. The tests are part of a series of research projects of a programme called the Space Robotics Strategic Research Cluster, funded by the European Commission via the Horizon2020 Programme.